We’d love your help. Let us know what’s wrong with this preview of The Adventures of Miss Petitfour by Anne Michaels. To ask other readers questions about The Adventures of Miss Petitfour, please sign up. Mary Poppins meets Jenny and the Cat Club in this collection of five illustrated stories that delight and amuse from their adventurous beginning to their happy end. I really wanted to like this more than I did. There were parts of it that sparkled and that I really enjoyed, but most of it I just didn't care too much about and some of the explanations and "digressions" (toward the end I was really hating that word) felt almost...I'm not even sure - not condescending, but too talk down-ish to kids? And the very lengthy lists of cat names and long convoluted names of most of the women of the town got old really quickly. I just jumped over them and I feel that I really wanted to like this more than I did. There were parts of it that sparkled and that I really enjoyed, but most of it I just didn't care too much about and some of the explanations and "digressions" (toward the end I was really hating that word) felt almost...I'm not even sure - not condescending, but too talk down-ish to kids? And the very lengthy lists of cat names and long convoluted names of most of the women of the town got old really quickly. I just jumped over them and I feel that most kids would find them difficult rather than humorous. I liked the premise of this kind of kooky woman living with all of these cats who travels by tablecloth. It was kind of like a cross between Amelia Bedelia and Mary Poppins. It just didn't quite work for me. I think it would have been better if there had been fewer cats with more time spent exploring their personalities. There was more telling than showing for my taste and for the age group it's being market for. It's not often that I will reach for a children's book, but when I do it's normally for something that's light, quirky and easy to read - and this definitely delivered in those areas. I don't have children myself, but I do have cats who were present during the time of my reading this book. So that counts, right? If Mary Poppins was a kooky cat lady, this would be her book. These little short stories follow the adventures of Miss Petitfour, her sixteen cats, and her tablecloth choice for the day. As It's not often that I will reach for a children's book, but when I do it's normally for something that's light, quirky and easy to read - and this definitely delivered in those areas. As far as a read-out-loud stories go, these are great. The writing has a rhythm to it that I feel would be incredibly comforting to listen to, and the stories are sweet and whimsical. There are 'bigger' words added throughout the story, similar to what you see in the 'A Series of Unfortunate Events' books, but these stories are far cuter, have more lace, and a considerably larger number of cats. Would recommend reading to children. Such a charming children's book! And the illustrations are super cute. Loved the bits of wisdom from Miss Petitfour's adventures and all her adorable cats! I was lucky enough to get an ARC of this book at BEA, and it was so utterly charming and adorable. Being a big cat lover I couldn't help buy enjoy the story of Miss Petitfour, a fantastical Mary Poppins type character and her 16 cats. She sometimes takes off in flight by grabbing a tablecloth and puffing it up like a balloon, and her cats all follow by grabbing tails and forming a long string of cats. Sound weird? It totally is, but in way I could really appreciate. The book has 5 short stories i I was lucky enough to get an ARC of this book at BEA, and it was so utterly charming and adorable. Being a big cat lover I couldn't help buy enjoy the story of Miss Petitfour, a fantastical Mary Poppins type character and her 16 cats. She sometimes takes off in flight by grabbing a tablecloth and puffing it up like a balloon, and her cats all follow by grabbing tails and forming a long string of cats. Sound weird? It totally is, but in way I could really appreciate. The book has 5 short stories in it. There is no real overarching story line, so just enjoy the little tales for what they are worth. There are many things that occur that feel ridiculous (imagine cats taking dance lessons, or just flying around). This should give you a good feel for the book: "The cats, who ever missed an opportunity to fly, leaped into formation, linking tails and toes, and up drifted the furry catrope, dark and wavering against the white winter sky." The writing style is also unique. According to her bio Anne Michaels is a poet, and the prose in this book definitely has a flower-y sort of feel to it. She also plays around with storytelling a bit, introducing the reader to concepts such as how a story shows it's going to change directions but using a phrase such as "then one day." It feels more like a person sitting down to tell you a story, rather than being totally submersed in the tale. The book contains a number of illustrations by Emma Block, which are just lovely and perfectly capture the spirit of the writing. The colors and technique feel very whimsical, and though my copy was mostly in black and white, the final version will have full color illustrations. Either way, I still read it. This was an adorable book! I wish my niece were more than 4 months old, cause I'd totally give it to her! This is a perfect book for a little girl (but not THAT little, let's face it, she doesn't even know I'm her aunt yet..). And the last thing that I thought was just so neat was how you learn as you read, but this was incorporated in a way that's fun and being apart of the stories, you don't feel like your learning (nor would you have to stop to look up the word/definition). Very thoughtful! Absolutely charming. Considered a children's book, but I found it to be more of a sweet little collection of funny and interesting adventure's of a single lady and her many cats. Oh, I loved the kitties! Captain, Minky, and-okay, I'll stop. :) Anne Michaels throws words with complete and delightful abandon, making interesting and very perfect-y descriptions! *"The quiet sound of whiskers being licked clean"*-who would have thought to have described it that way?! Huh. I heard it described as a more modern Mrs Piggle Wiggle, but the sense of wonder wasn't the same for me. Also, the writing reminded me of Lemony Snicket, which should be a selling point, but wasn't. Some kids and parents will love this, but it was too twee even for me. This was a very sweet and whimsical book and is what you'd expect from a main character with the name of Miss Petitfour who has 16 cats. It's filled with four unbelievable but cute stories, vocabulary, tea parties, and knitting and baking. I think 1st-4th graders would enjoy it. The illustrations are equally whimsical and might either scare some readers off or might be exactly what some readers need. Note: I totally bought this book because of the cover. I skim read this, it's only about 100 pages and I did NOT enjoy it at all. I thought it would be a lovely mix between the Dutch Minoes and Mary Poppins, it turns out it's a super basic story format repeated over and over in a bad way. A sort of fake teaching narrative about story lines and words kids will never in their lives run into. I don't like it. The stories weren't entertaining either and most paragraphs were just the same sentence written in 6 different ways.. This is a terrific collection of whimsical adventures of Miss Petitfour and her collection of cats who all travel by tablecloth in the wind. It uses beautiful triple-scoop words and will be fabulous to use to teach writing to my grade 4s and the power of words. A very delightful children's book! Miss Petitfour makes one think a little of Mary Poppins as she flies with the help of her tablecloth. Each day she has little adventures, accompanied by her sixteen cats! A charming read that left me with a smile on my face. I absolutely adored the writing and illustrations of this book! It was a sweet story with an old-fashioned sensibility. This book is as delightful as a plate of petit fours - delicious, looks simple but must be crafted by a master, and thoroughly enjoyable. The author of this book is Anne Michaels. She is the poet laureate of Canada and I’m not even exaggerating when I tell you that she is amazing. I have a little jolt of celebrity love for her. Ms. Michael’s approach seems to be to weave layers in her work. Now, this book is not an adult book of poetry but I can see her style. Changing the genre does not mask the artist. The words march across the page, irreverent of narrative flow, unafraid of run-on sentences, and indulging in glorious word play. Really, this book was designed to be read aloud. The book is also a very clever way to introduce kids to writing techniques. Each chapter highlights words (giving their meanings) and also provides very simple explanations of narrative conventions. The illustrator (Emma Block) adds another layer to the book. Her pictures look like they are water colors with rich golds, blues, pinks, and greens. I love that she uses lots of texture in each illustration that invites the reader into Miss Pettifour’s whimsical world. 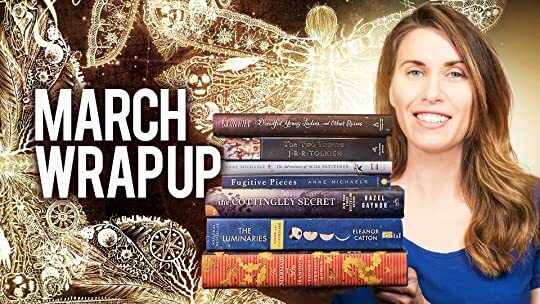 This helps create a connection with the reader because it feels like we could actually touch and feel each page. First sentence: Very soon you will be meeting Miss Petitfour, and so, just to be sure you'll recognize her, this is what she looks like. I loved this one from the very first page. Even before I turned the page to see that lovely phrase, "...and her Cats." Love isn't strong enough really. Let's make it LOVE, LOVE, LOVE. Miss Petitfour is a gush-worthy read if ever there was one! So what is it about? The adventures that Miss Petitfour has with her sixteen cats. They get around town by flying--sail First sentence: Very soon you will be meeting Miss Petitfour, and so, just to be sure you'll recognize her, this is what she looks like. So what is it about? The adventures that Miss Petitfour has with her sixteen cats. They get around town by flying--sailing in the wind using a tablecloth. What kind of adventures do they have? Are they big or small? And some adventures are just the right size--fitting into a single, magical day. And these are the sort of adventures Miss Petitfour had. Miss Petitfour and the "Oom"
The writing is absolutely lovely, charming, delightful, and practically perfect. Do you know what a digression is? Well, of course you do. A digression is like quicksand or a whirlpool--sometimes you just can't find your way out of one. It's the part of a story that some people think is the most fun, when the story wanders off the point and gets lost, giving us all sorts of information that has nothing to do with getting us from the beginning to the end. A digression is just like what happens when you're walking to school: you stop to tie your shoelaces and notice the neighbor's dog looking at you, and so you stop to give it a pat, and then you see the fence has started to fall down, and so you have to climb it just a little, and then you look up and realize the clouds are in the shape of pianos, and then, oh dear, you suddenly remember you were on your way to school and you have to run all the rest of the way so you won't be late. That is a digression. Now, where were we? An eccentricity is something everyone has--but everyone has a different one. An eccentricity is a quirky thing we like to do just because. Perhaps you always like to put on your right shoe first. Or perhaps you like to count by twos when you're bored. Or perhaps you only like to eat popcorn on Tuesdays. Or perhaps you like to count digressions and keep a record of them at the back of every book you read. I enjoyed getting to know the characters. I loved Miss Petitfour, of course. But I also enjoyed all sixteen of her cats. Though probably Minky and Sizzles were my favorite. Other characters--human characters--that I enjoyed include: Mrs. Collarwaller (the bookseller), Mrs. Carruther (the grocery shop owner) and Mr. Coneybeare (confetti shop owner). I also loved, loved, loved the illustrations. They were cute, sweet, charming, and absolutely perfect. Clever, whimsical, and delightful, like Miss Petitfour herself. This was such a funny little book. I mean that in both senses of the word. It had amusing things that happened, lik Clever, whimsical, and delightful, like Miss Petitfour herself. A delightful, light read-aloud with many cats and zero stressful bits. My eight-year-old daughter and I loved the story and the charming illustrations. It reminded me—and my mother—a lot of the Mary Poppins books. The repetition of the 16 cats’ names is a staple for children’s literature. For us in particular, we found the extended and voluminous last names of many of the characters to be a tongue-in-cheek parody of how hyphenated some of our fellow Brits are. The short stories are more about adventure and the personalities of the cats than they are about the humans— My eight-year-old daughter and I loved the story and the charming illustrations. It reminded me—and my mother—a lot of the Mary Poppins books. The short stories are more about adventure and the personalities of the cats than they are about the humans—although nearly every human in these stories has his or her own eccentricity. A side-effect of the narration is that it teaches about literary elements and narration. It is obvious that the author loves words, and thinks children should love words, too. (I don’t disagree—my high school English students have shockingly poor vocabularies.) However, this is also a downfall to the book. The target audience is grades 1-4, but the long and complex sentences, as well as the higher-level vocabulary, bring it to a Lexile level around 1380. This translates to about a 10th grade level and puts it on a par with Pride and Prejudice. This presents somewhat of a problem. Even with the illustrations 144 pages is a lot for a first grader, and the text complexity is out of reach. For us, this was a great read-aloud book, with one of the short stories/chapters per session. This was nice, since my daughter is an advanced reader and didn’t really want read-alouds much any more. Perfect snuggle time! This is a children’s book. About all I can think of is that some people like children’s literature to be firmly rooted in reality, and this book does have some whimsical/semi-magical elements. Anyone who likes cats, whimsy, words, and a great read-aloud. Thank you, Net Galley for the advance reader ebook. As a forty-five year old woman, I'm not really this book's target audience. However, I found it utterly charming and thoroughly enjoyed reading it aloud to my daughter. I thought that she would find it babyish, as she's a ten-year-old going on teenage, but she loved it too. I think this is because it works on multiple levels: it is a series of mini-adventures, but it is also a book about language and how to write stories. There are many lists of words, including the names of Miss Petitfour's six As a forty-five year old woman, I'm not really this book's target audience. However, I found it utterly charming and thoroughly enjoyed reading it aloud to my daughter. I thought that she would find it babyish, as she's a ten-year-old going on teenage, but she loved it too. I think this is because it works on multiple levels: it is a series of mini-adventures, but it is also a book about language and how to write stories. There are many lists of words, including the names of Miss Petitfour's sixteen cats, but if you are someone who loves vocabulary, then you will appreciate the way Anne Michaels makes lyrical and poetic use of them, along with liberal helpings of assonance and alliteration. She also gives pointers on how to move a story along and take it off on tangents; which, as a keen writer, my daughter appreciated. I adored this book, and my 7yo daughter enjoyed it very much as well. Heck, even my 3yo son got a kick out of the cats. I checked this book out of the library after seeing it mentioned by a blogger I regularly read (Alison May at BrocanteHome), and I am so glad I did. It's very whimsical, with lovely illustrations. Miss Petitfour's adventures are just the right kind for reading about before bedtime, and that is exactly what we did. The kids were so sad at having to give her back to the library t I adored this book, and my 7yo daughter enjoyed it very much as well. Heck, even my 3yo son got a kick out of the cats. I checked this book out of the library after seeing it mentioned by a blogger I regularly read (Alison May at BrocanteHome), and I am so glad I did. It's very whimsical, with lovely illustrations. Miss Petitfour's adventures are just the right kind for reading about before bedtime, and that is exactly what we did. The kids were so sad at having to give her back to the library that I'll be adding a copy to our collection at home. There are sixteen cats, one of them is called Minky and loves cheese – so you know I adore this book already. There is also Misty, Taffy, Purrsia, Pirate, Mustard, Moutarde, Hemdala, Earring, Your Shyness, Grigorovich, Clasby, There 3 Captains: Captain Captain, Captain Catkin, Captain Clothespin and Sizzles. They dance, are into crafts and go flying with Miss Petitfour when she appropriate the tablecloth according the weather. 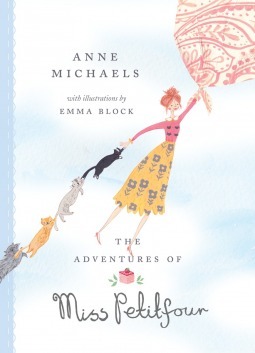 Anne There are sixteen cats, one of them is called Minky and loves cheese – so you know I adore this book already. There is also Misty, Taffy, Purrsia, Pirate, Mustard, Moutarde, Hemdala, Earring, Your Shyness, Grigorovich, Clasby, There 3 Captains: Captain Captain, Captain Catkin, Captain Clothespin and Sizzles. They dance, are into crafts and go flying with Miss Petitfour when she appropriate the tablecloth according the weather. Anne Michael narration is magical, it’s very engaging and I loved how she would explain words or plot devices. Add Emma Black’s wonderful illustrations, so full of colour and ideal for this book, well I really can’t find anything not to love. Miss Petitfours loves three things: baking delicious treats, her sixteen cats (yes, 16), and flying, by means of one of her favourite table cloths, with the sixteen cats in tow. Anne Michaels' delightful novel for children describes five adventures for Miss Petitfours and her felines. One of her mottoes is "If you have to do something every day - make it fun and you'll never be bored." She cleverly introduces difficult words for her readers (digression, festooning, debonair), always printed in a Miss Petitfours loves three things: baking delicious treats, her sixteen cats (yes, 16), and flying, by means of one of her favourite table cloths, with the sixteen cats in tow. Anne Michaels' delightful novel for children describes five adventures for Miss Petitfours and her felines. One of her mottoes is "If you have to do something every day - make it fun and you'll never be bored." My daughter read this and was really keen for us to read it together, so we did. This is a really sweet book, reminiscent of old fashioned children's books where the adventures involve little peril or unpleasantness. A lady owns too many cats and goes about her everyday life with a little bit of magic thrown in. I also like that the author deliberately introduces challenging vocabulary - but explains the new words each time. The illustrations are also very sweet. Not a book I'd read on my own, but v My daughter read this and was really keen for us to read it together, so we did. These are four short stories of Miss Petitfour and her group of cats. There are a lot of cats and they have the cutest names ever. They have adventures like chasing down a very valuable lost stamp that flew out the window while looking at her stamp collection, a mini explosion at the confetti factory and running out of marmlade. Simple fun adventures that most kids would love to read about. The pictures are beautiful and full of color. The one thing I really loved about this book is the fact tha These are four short stories of Miss Petitfour and her group of cats. There are a lot of cats and they have the cutest names ever. The one thing I really loved about this book is the fact that every big word was highlighted and explained. It was cute!